Replacement earphones for Wrap video eyewear. These are the same high-quality, noise isolating earphones that come as standard equipment with all Wrap video eyewear. 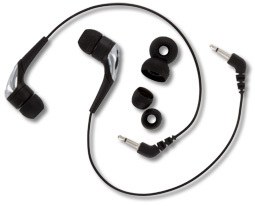 Ideal replacements for lost or damaged Wrap earphones, complete with 3-pair of noise-isolation earbud rings: small, medium and large. Note: These earphones are for “Wrap” model eyewear only. Their connectors are not compatible with “iWear” model video eyewear.